These are just fabulous colors aren't they? I've been seeing chevrons everywhere lately and I really thought these colors would look pretty with the chevron pattern. I don't have any chevron stamps, dies or designer paper so I needed to figure out how to make them myself. I only needed 3 supplies - paper trimmer, bone folder and scissors. 1. 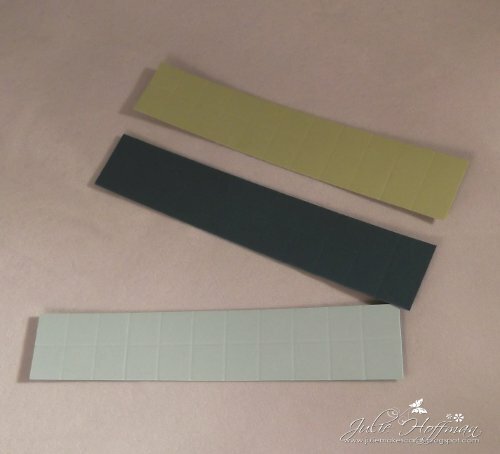 Cut a strip of cardstock to 1" by 5.5". 5. Cut opposite triangles out on the opposite side. That's it! Really it wasn't too hard to do at all and I like the extra dimension that the score lines give to the pattern. A big congrats, Julie. I'm not suprised your 'bun in the oven' card was a winner in the challenge. It was so cute and creative. So is this one. Love your chevrons and the score lines really add to them. Great job! WOW--this is really cool! I thank you for showing us to make the chevrons...I don't have any punches or stamps either, so I might just have to try this! Thanks so much for playing with my Paper Players colors this week! I really like this CAS design and I was happy to read your directions for the chevrons! Very effective! This is fantastic! What a quick and clever way to create a chevron design. Thanks for joining us again at The Paper Players! This is fabulous Julie! Love the clean look and the addition of the score lines on the chevrons...so clever! Great way to feature the colors too! Thank you for joining us at The Paper Players! 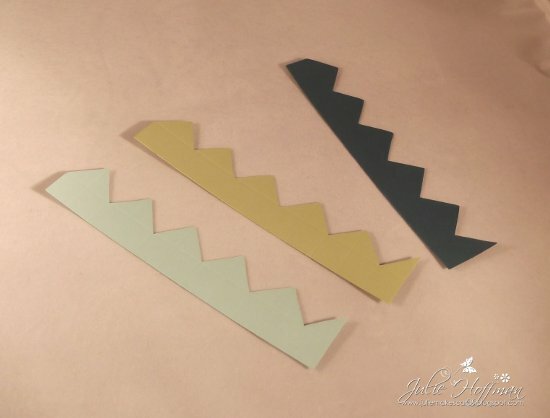 I've been seeing chevrons everywhere too and want to buy the die cut but you idea is very clever. Your card looks very nice and clean. Thanks for sharing the technique. I had no clue how to make chevrons, thank you for sharing this cool technique!! Need to try it. Great card, love how you showcased the colours. Thanks for joining us this week at the Paper Players. Oh, my goodness!! What a striking card and yet so simple. Thanks for sharing the quick "how to" on making a chevron pattern. Loving the way you showcased the color combo in such a simple, but fun way!! SO glad you joined in the fun at The Paper Players! I love your card, Julie! The score lines on the chevrons look amazing. 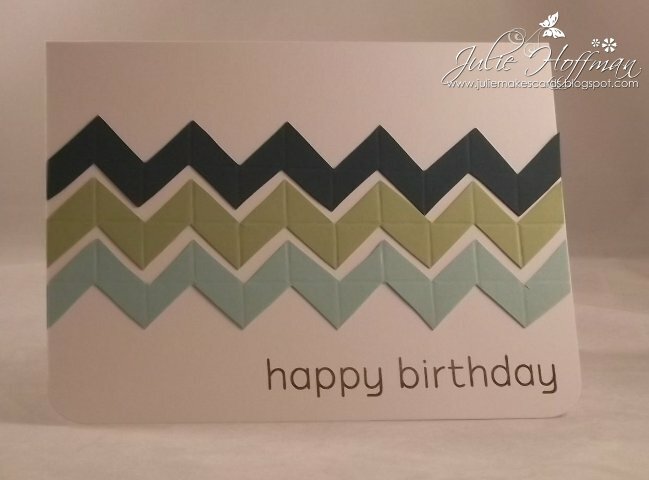 Julie, it's me again...I just saw this challenge and thought you may like to make another chevron card and enter. I am very exciting about using your tutorial. Wow! Thanks for sharing this great technique. Hi Julie thanks for following me on my blog and I just jumped into the Chevron train and made my own so you will have to check mine out but I found another way to do it with DSP. Now the I got my feet wet I will have to try your way next. Thanks for the motivation girl. Are you going to convention? I am and will be a LNS reporter so look for me without the curls though. LOL! A Digital Freebie to Thank You! !